Something wonderful is happening in Keene. It’s always been a very pleasant city, with a small-town, friendly vibe. With two great springboards — a vital state college and a vibrant Main Street lined with successful retail spots — seeds are starting to bloom downtown. And the gardeners are the young people coming back to the town where they went school or grew up. They are putting their hearts and souls into making Keene the kind of city in which they want to live, work and dine. Paris has earned the title of benevolent godfather of Keene cuisine. His enthusiasm for the town is infectious. He loves to help, coach and mentor any new talent, and he travels nationwide to promote the area. In 2013 appeared on — and won — the Food Network show “Guy’s Grocery Games.” On WKBK radio, he often talks about other chefs and new dining ventures, and he also helps run Top Chef events to fundraise for local culinary education and promote Keene’s talent. He’s “The Man” in Keene, according to all those enterprising young chefs. One young chef with new ideas is Jordan Scott*, executive chef at Odelay, an Asian/Mexican fusion fast-serve eatery down the block from Luca’s. At age 19, Scott found himself commanding the menu for a small chain of restaurants, pretty much right out of culinary school in San Francisco. A few years ago, he came back to town to help make it a great place to live. “Once people come into Keene as a waypoint or wrong turn, they come back on purpose,” he says. A street full of great dining options, entertainment and diversions can do that. Keene is actively trying to keep young professionals happy and in town. Odelay, owned by Ash Shaheen, moved into new quarters from across the street about two years ago. The space is bright and clean, and the concept seems ripe for expansion. The menu, offered for lunch and dinner, is a contemporary ode to Mexican street food, including burritos, tacos and rice bowls, similar to You Know Who. Except here the options skew Asian, with Korean BBQ or Kogi, crispy pork belly and Ahi tuna. The flavors are juiced up with tang from house-pickled vegetables, Asian slaw and spicy aioli. Bright tasting and healthy salad options fill out the bill. Scott is also part of the new Keene scene that includes arts promoters Machina Arts, which was founded in 2013 by Danya Landis and Rebecca Hamilton. Scott, a culinary partner, is working with the organization to provide catering for events that are designed, managed and promoted by the group, who maintains an office in the Hannah Grimes Center. Scott and Machina Arts also ran a series of farm-to-table events this past summer, which quickly sold out. Showcase for art and artists and performers Local restaurants are challenged to make a dish using a specified seasonal produce. Another young chef ready to rumble is Chef Ryan Nyland, who was the former sous chef and then chef at 21 Bar & Grill on Roxbury Street. The space is what a neighborhood bar should be — comfortable with great comfort food. When he took over, he amped up the flavor of the usual suspects to 11, and offered creative takes on comfort food, such as his Parmesan portobello fries with a Peruvian aji sauce. A few weeks after my Keene visit, Nyland left 21 Bar & Grill to work as sous chef at Luca’s Mediterranean Café (Brendan Dolan, formerly of Tillie’s, replaced Nyland). There, Nyland will be able to spread his wings tinkering with a more diverse menu under the oversight of Keene’s godfather of food. Based on his former work at 21 Bar & Grill, I look forward to seeing what he’ll accomplish with Paris. Paris gets excited when a new restaurant opens downtown, believing that change is always good. The latest is Tillie’s, just off the top of the square. Owners Tabatha Eisner and Chef Steve Bentley named the place after Bentley’s great aunt, who ran whiskey from Canada to New Hampshire during Prohibition. To further the speakeasy theme, they completely transformed the former Tony Clamato’s with tasteful lighting, paint, a grand piano and ever-expanding whiskey list. More space in the adjoining room allows patrons to dine (or say grace) while seated in antique church pews. While Bentley contributes in the kitchen, Tillie’s chef is John Rossey, the former head chef at 21 Bar & Grill and a real find for the setting. Here, he can do comfort food and more upscale entrées, turning it up to 12 with bacon-wrapped chicken wings coated with a bourbon Moxie glaze or deviled eggs with the options of caviar, sashimi tuna or pittance. For lunch, he offers an array of sandwiches, from duck confit sliders to blackened salmon tacos to a house-cured corned beef Reuben piled high with sauerkraut. The dinner menu adds house-made gnocchi in a brown butter sage sauce, pork tenderloin with mashed celery root and chicken Marengo with a quail egg, steamed crawfish and a very citrusy cilantro-lime sauce. The menu is tricked out nicely, but still approachable. There are many other popular places to dine in Keene. Spice Chambers for authentic Indian cuisine, vegetarian and more; Local Burger for a fast but succulent burger; Fireworks with it’s inviting interior and Nicola’s with its Old World Charm in the nicely developed Railroad Square Square continue to broaden the spectrum of restaurant options as Keene blossoms as a destinations for art, entertainment and good food. The Colonial Theater, the new MoCo Arts Center at 40 Roxbury St., the Hannah Grimes Center at 25 Roxbury St. and First Friday Art Hop are all downtown magnets. In June of next year, a Mural Festival will bring a team of professional muralists, the Walldogs, to paint the town with beautiful images. In Keene, all is good and it’s getting even better — and that’s what keeps Paris smiling. Oh, look, there is a new pho restaurant going in right next to Luca’s! Is he still smiling? Yup! *Editor’s note: A previous version of this story incorrectly named Jordan Scott as the owner of Odelay. Changes were also made to clarify his connection to and the location of Machina Arts. 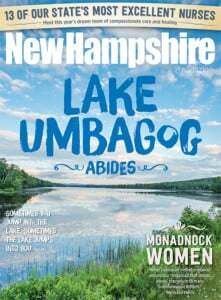 New Hampshire Magazine regrets the errors. This American bistro, owned by the Benik family for more than 30 years, has recently expanded. Open for lunch, dinner and Sunday brunch. Closed Mondays. Open 3 p.m. to 1 a.m., Monday through Thursday, and Friday from 11 to 1 a.m.